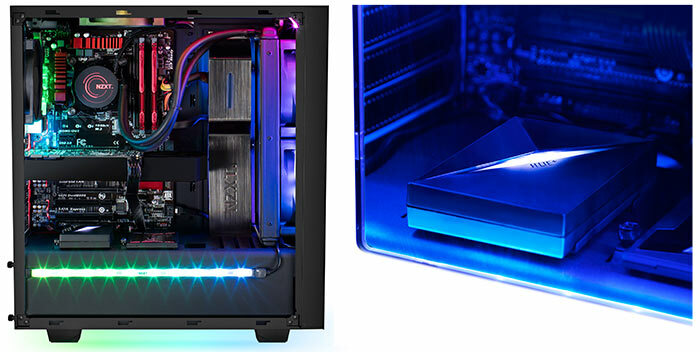 NZXT has launched the HUE+ digital lighting solution for PCs. The HUE+ box is an advanced lighting device, with dual independent channel lighting output, capable of addressing up to eight LED strips. It can be controlled by NZXT's CAM software and includes 'smart' functionality, reacting to PC system condition changes and/or audio. "Lighting can truly bring your system to a new visual dimension, that’s why most of our cases provide windowed-panels. With a smart, easy-to use digital interface such as CAM, available for everyone as a free app, HUE+ offers unmatched control and customization for users seeking to bring their PC to the next level," said Johnny Hou, NZXT’s founder and CEO, at the device launch. The NZXT HUE+ requires 5V of DC power and connects to your PC via USB. NZXT has designed so it's not just another black box; the faceted design includes its own swash of LED lighting. The two LED lighting channel connectors can control up to four LED strips each, making a total capacity of eight for your system with a HUE+ installed. In the package you will get four LED strips included (either magnetically attachable, or with 3M tape option) plus four extension cables of various lengths to aid in LED positioning throughout your system. As mentioned in the intro, users employ the free NZXT CAM software to control the lighting offered by HUE+. 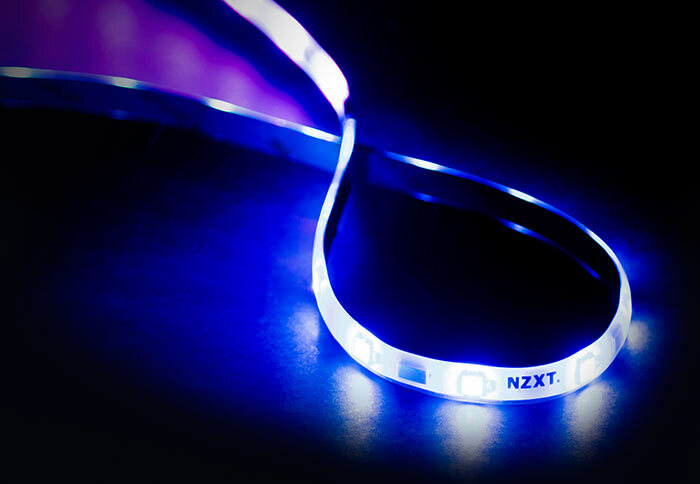 To make things simple and convenient NZXT has concocted eight pre-set lighting effects, each customisable. For the ultimate in lighting flexibility each LED is individually addressable in the device's custom mode. Smart and audio modes enhance the LED lighting effects already available. HUE+ lighting can be set to react to changes in CPU or GPU temperatures and gaming FPS, for example. In audio mode, as you might guess, the LEDs can react to the beats of the music and game sound effects. Turning to pricing and availability, NZXT tells us that the HUE+ is available for pre-order now for £39.99 / €59.99 +VAT. An extension kit with 2 additional LED strips will be made available shortly, priced at £14.99 / €19.99 +VAT. Buyers get a two year warranty. Quite disappointed they didn't keep the form factor of the 1st gen Hue and have it mounted in the 5.25" bay with physical controls over digital. The problem I see is that so many different companies have their own RGB/LED lighting systems. You need half a dosen incompatible apps all running in your tray if you want the whole thing. nzxt tells us that the hue+ is available for pre-order now for £39.99 / €59.99 +vat. Do people actually pay that to put lights in a PC? No wait, of course they do. Do you think the Philips legal department have called yet?